STOP THE PRESS! THESE COOKIES CONTAIN JUST 4 INGREDIENTS! Forget shop bought ginger nut biscuits which are full of grains, refined sugar, dairy and other nasties, these my friends are going to be the nicest cookies you have made all year. Not only is ginger great for aiding digestion, reducing nausea and helping fight off flu and the common cold, it is also the perfect addition to these cookies and gives them a delicious spicy warmth. A perfect plate full for the wintry nights, sat in front of a log burner with a good movie. The best thing about this cookie recipe is that you can quite literally substitute the ginger for ANYTHING you like. You could even make the cookies plain with just three ingredients (nut butter, coconut sugar and 1 egg!) or why not add in some vanilla, raisins, cranberries, orange zest etc, jazz them up and go wild! As you have all probably worked out by now I am a huge fan of nut butters. I put them in to smoothies, curries, energy balls and now they have formed the base of my new cookie recipe. 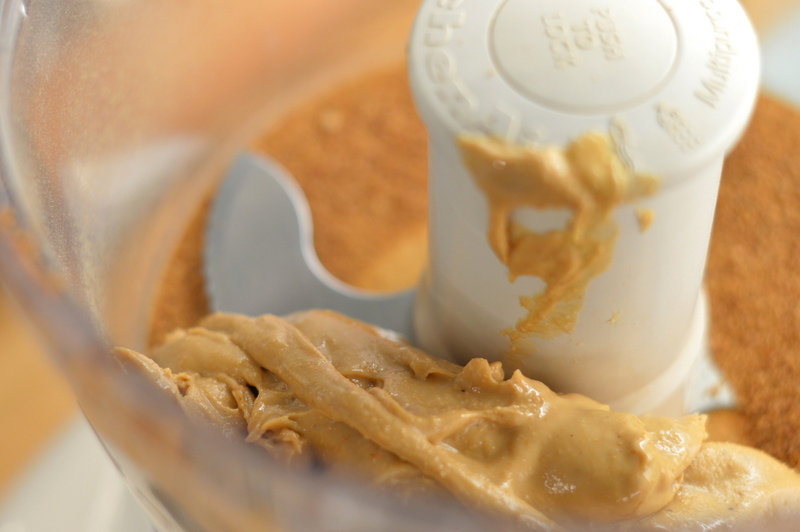 The option for nut butter is entirely up to you, I have tried the recipe with almond (crunchy and smooth) and cashew nut butter, but I am sure if you wanted to use peanut butter or hazelnut butter, or even a seed butter for those who suffer from nut allergies then this would work well too. I usually buy nut butters in the 1kg tubs, just because I use them so much and they are much more affordable that way. It’s crazy how much some nut butters sell for, (I’ve seen 170g jars selling for as much as £6.99 a jar). It’s completely ridiculous and elitist and makes a mockery, in my eyes, of the consumer. If you can make almond butter yourself, then do, it’s simple and much cheaper but I realise that it’s sometimes easier just to pluck a jar from the shelf or click “buy it now” from an online shop! The nut butter that I am particularly obsessing over at the moment is by an online company called Bulk Powders (they ship UK wide and Internationally too!). I will only ever do shout outs to brands I like and have used for a while (I am my own guinea pig!). I think they are a brilliant brand and their nut butter range is by far one of the best I’ve tried. Their 1kg tubs are very reasonably priced too at £11.99. Back to the cookies, the texture of them is my favourite part as they are so chewy and have the perfect crunch on the outside but then the delicious chew factor. I have tried so many paleo cookies in the past that just crumble and don’t taste right, with you being left wildly disappointed and seeking the closest shop to indulge in the real thing. However, with this recipe you will never have to go to a Millie’s Cookie stand again. Get your friends, kids and grandchildren involved and make baking with good ingredients fun! The simplest cookie recipe on the internet, chewy with the warming spice of the ginger. These are seriously delicious and very simple to make. Hello Emi, these would be so delicious with some orange zest I believe! You have a winner here my friend! Nut butter is sooooo my downfall. Can’t keep it in the house! Sometimes when I buy it for a recipe, I eat it before I have a chance to use it. I’m an utter addict! P.S. This recipe is simple genius. Love this idea, but what is coconut sugar? And can I use anything else? Hi Liz, thank you for your comment. Coconut sugar / coconut palm sugar, is made from sap of the coconut palm that has been extracted and then boiled and dehydrated. It has a similar taste and consistency to brown sugar and gives the biscuits their caramel like chew. I just use it as it’s more natural than brown sugar, but of course you could substitute the coconut sugar for any brown sugar (I would stick to dark or light muscovado sugar) , or a sweetener like Stevia or Palmyra Jaggery (You would only need to use 1/4 the amount in the recipe). Note: don’t confuse coconut palm sugar with palm sugar, which is derived from the sugar palm tree. Palm sugar is often used in Thai dishes!). Coconut sugar’s sold in all health food shops and most supermarkets. Sorry if this’s a ramble and hope that all helps! This is a simple recipe with outstanding results and it’s healthy to boot! The biscuits were a perfect combination of crunchy on the outside with a chewy interior and stayed that way for a couple of days….I don’t think they’d last any longer in any household! The ginger taste and warmth are a perfect winter accompaniment to a nice hot drink . I look forward to experimenting with lots of different flavours and trying them out as Christmas tree decorations in a thicker version instead o f gingerbread . Keep up the inspiring work . Hello! I’m excited to try these this Holiday season since Ginger cookies of any kind are a favorite! I keep away from nuts especially almond because they try to kill me….I’m hoping Sun Butter will work. I am in the States and would like to know if your measurements are in volume or weight? I just need to know how to measure. Thanks!!! Hi Emma, I’ve just made this but the dough was a lot more oily than I was expecting and when I took the biscuits out of the oven oil was oozing out of the biscuits. Is this normal? Hi Louise, oh no, this isn’t good, you must be very disappointed! Did they set ok or remain not good? Can I confirm, did you mix the nut butter well before adding it in as it can be very oily unless the oil is well mixed in the jar beforehand. Otherwise, if you used all the ingredients as mentioned I don’t know what could have gone wrong as they certainly should not be oily in the slightest! Hi Emma. Yes I did mix the nut butter as well as I could. They actually turned out fine when they came out and had cooled. So much so I’ve just doubled the recipe and made more. Delicious!! These sound delicious! Do you think an egg replacer would work (I am allergic to chicken eggs)? Something like Ener-G egg replacer? YUM!! just made these, only had peanut butter and pumpkin pie spice…so delicious and easy!! thanks!!!! Can you use coconut butter for the nut replacement? Wow these look delicious.. As a Celiac and a ginger nut lover these are next on my list to make. Cant wait to try these. They look delicious. Thanks for such a great recipe. I’ll make them tomorrow. I’ll try it with mixed spices, replace the suger for half and the other half adding apple sauce and replace the eggs with chia. These sound so good! Just the kind of simple cookie I like to make. Are there any US readers who have figured out volume measurements? I know, I know, weight is more accurate, but I don’t have a kitchen scale. Hello! These are absolutely delicious, I am a pensioner with gluten intolerance. Please Mrs.P how many do you recommend at one sitting? Oh! forgot to mention the really dark choc I drizzled on top,I made 9 large ones and have eaten 2 but want more!!!!! Yummy! Thank you Mrs.P I’ll do that,trouble is though there’s only me to eat them…..wouldn’t want them to go ‘off’! Perhaps I should share with friends really! Hi- if you used another powdered / granulated sugar it would be exactly the same in amounts. Thank you for prompt reply. Just waiting for my oven to be repaired then i will let you know. Have to do everything on stove top at the moment.